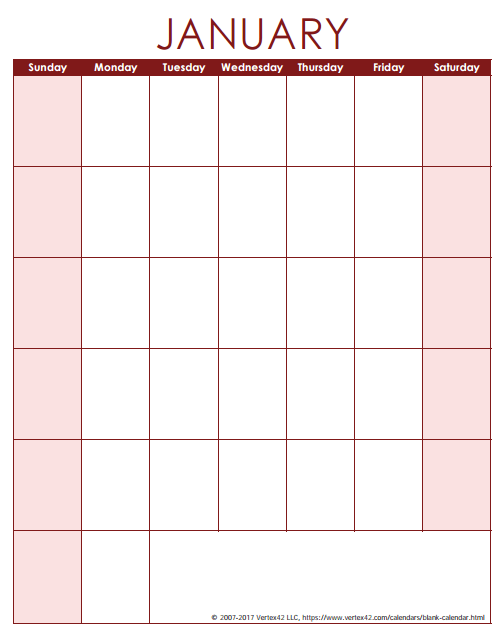 Need a truly blank calendar - a calendar page without any numbers or month names? If so, you found the right page. 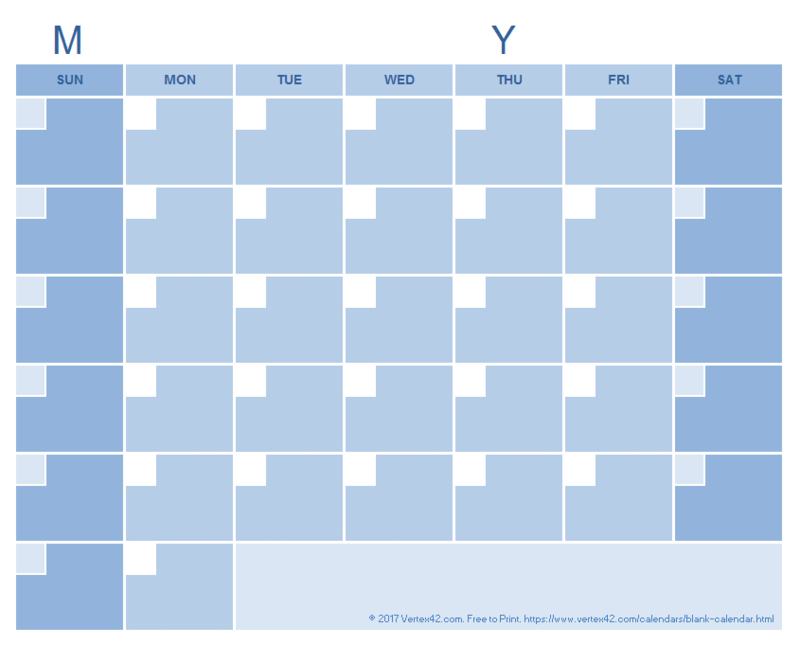 You can download a number of different free printable blank calendars from this page in a variety of colors and formats. 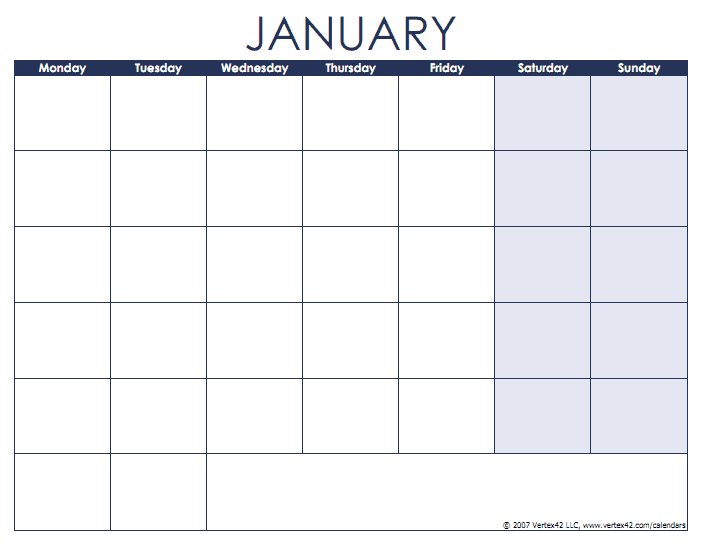 You can also download a blank calendar template for Microsoft Excel. If you want a blank calendar that includes the days and months of the year, check out our printable calendars, or try our other calendar templates. 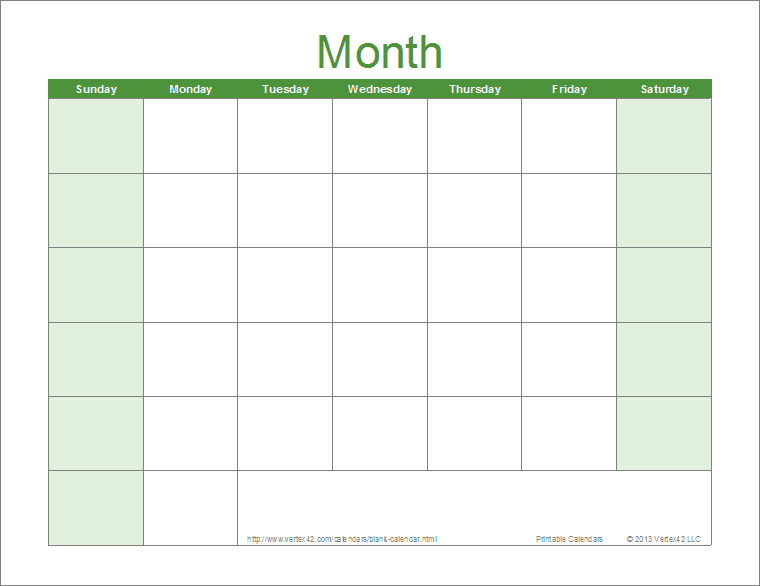 This theme-enabled blank monthly calendar template allows you to change the color and the fonts used in the calendar by simply selecting a new theme in Excel. Just go to Page Layout > Colors or Fonts. 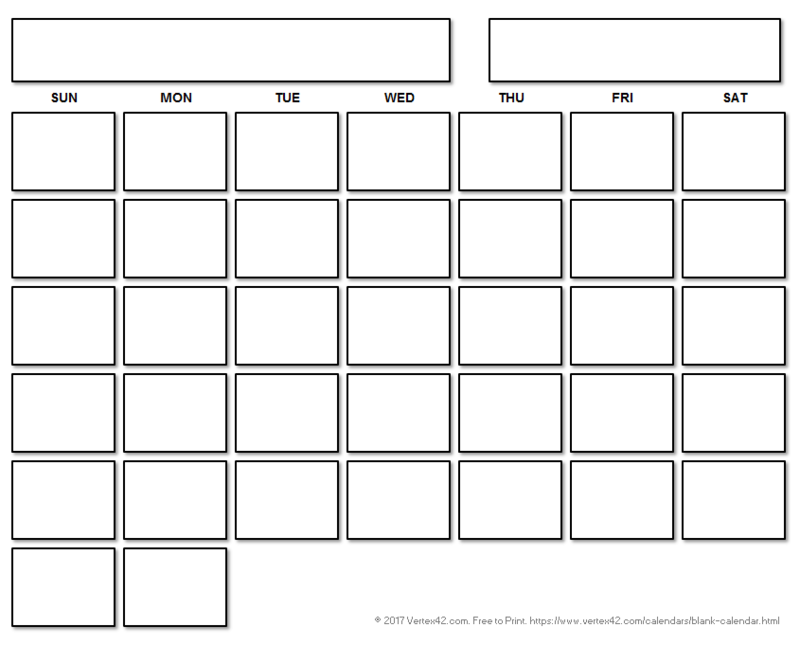 The following printable blank calendars are available as PDF downloads and may be used to print as many paper copies as you need, free of charge, provided that the copyright notice is not removed. 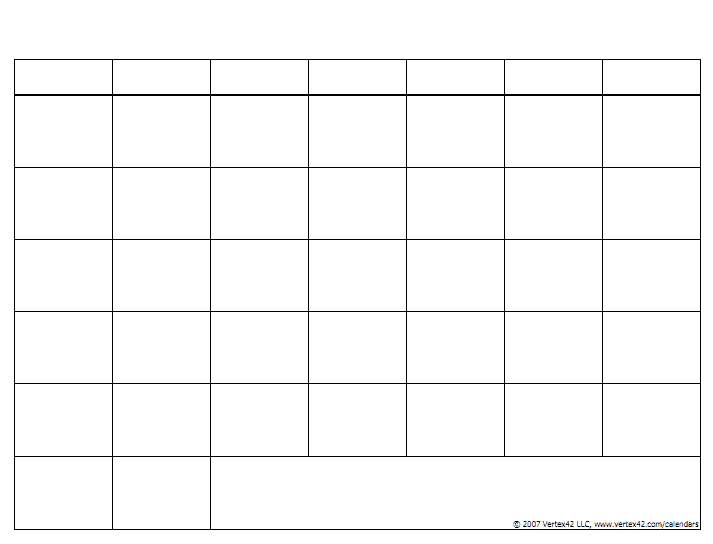 You may not make the file downloadable from a public server or website, but feel free to link to this page or even to a specific PDF file, because these blank calendars are never out of date. 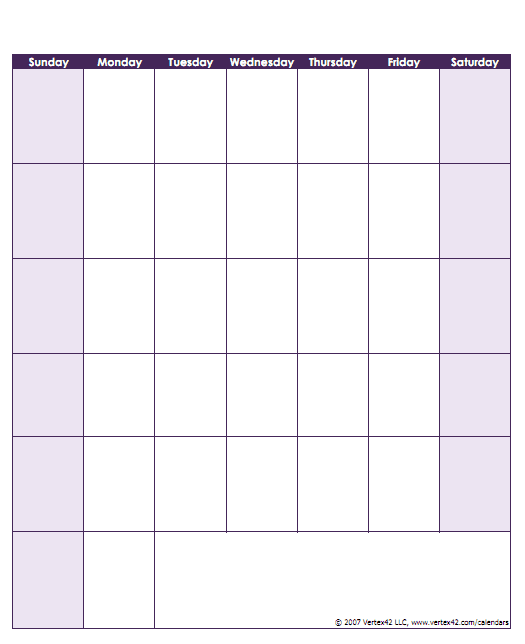 This design includes the days of the week but allows you to write in the month name. It is available in both Sunday and Monday-first formats. Similar to the previous landscape design, except that this one is in Portrait orientation. 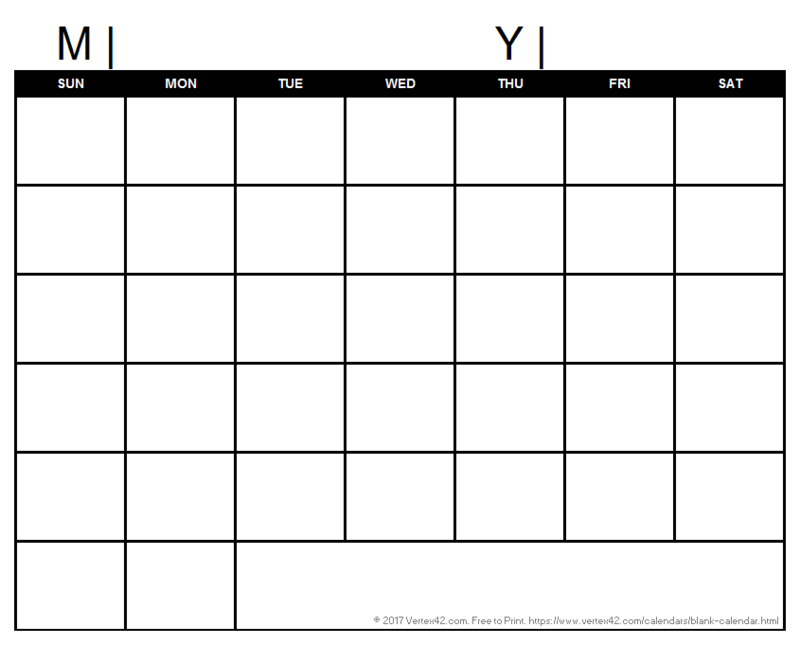 Prints only the outline for the days of the month, so you can stamp, color, or write in your own days as you see fit. 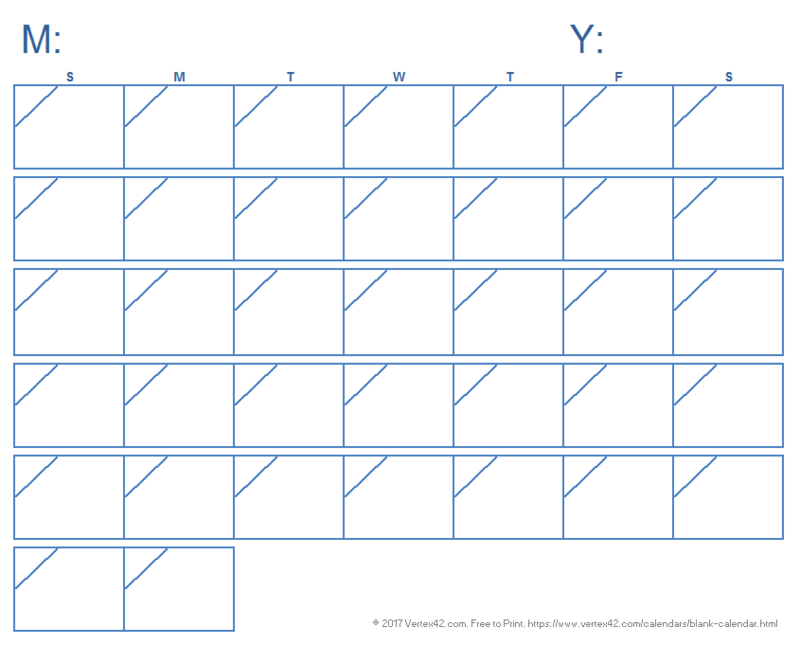 The following free blank calendar designs include 12 pages with a separate month on each page and are available in a variety of colors. The calendars have both the month name and the days of the week listed at the top in either the standard Sunday-Saturday or Monday-Sunday formats. 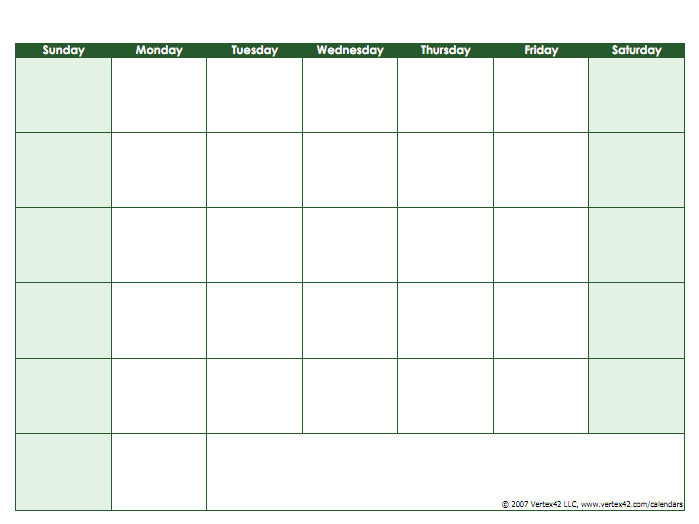 This screenshot shows the Monday-Sunday format. In both formats, the days with the light background shading are Sunday and Saturday. 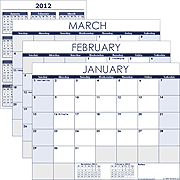 These 12-month blank calendars are the same as the previous design except for page orientation. The screenshot shows the red version. The following designs were created by Vertex42 in January of 2017 after a flurry of intense creative brainstorming after asking ourselves "How can we take a boring calendar grid and do something interesting with it and still have it be functional?" 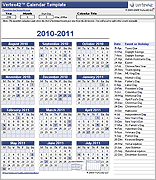 These are available as PDF downloads and are designed for printing and filling in the month name, year, and days by hand. 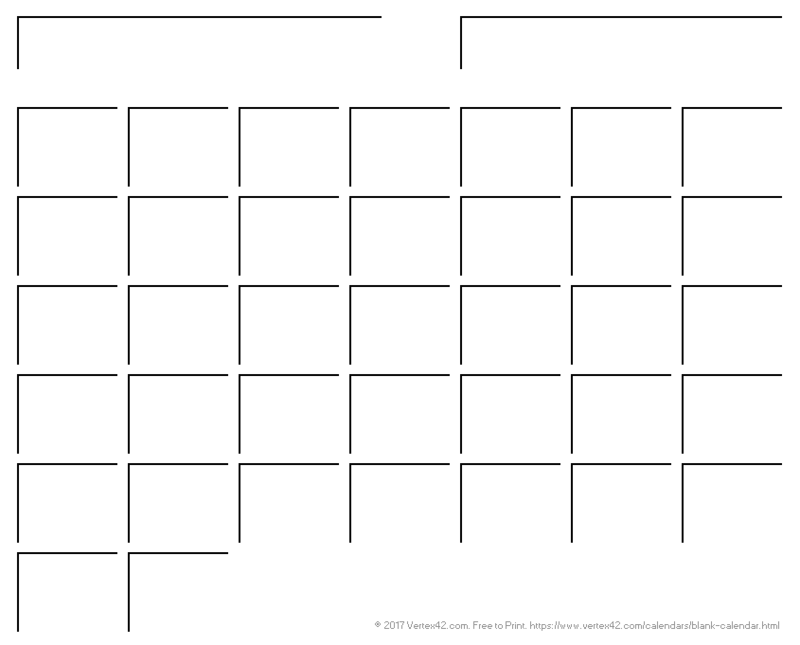 As its name implies, this design was an attempt to create a calendar grid using very little text, lines or shading. This design uses a combination of borders and bold background shading to subtly emphasize typical work days (Monday-Friday) instead of the more common approach of shading the weekends. This is a fun design where we basically reversed the borders and shading. If you can spare the ink, this is a pretty cool looking calendar. This design came about accidentally as I was trying to create something with some shading. It kind of reminds me of the old Access database form fields. 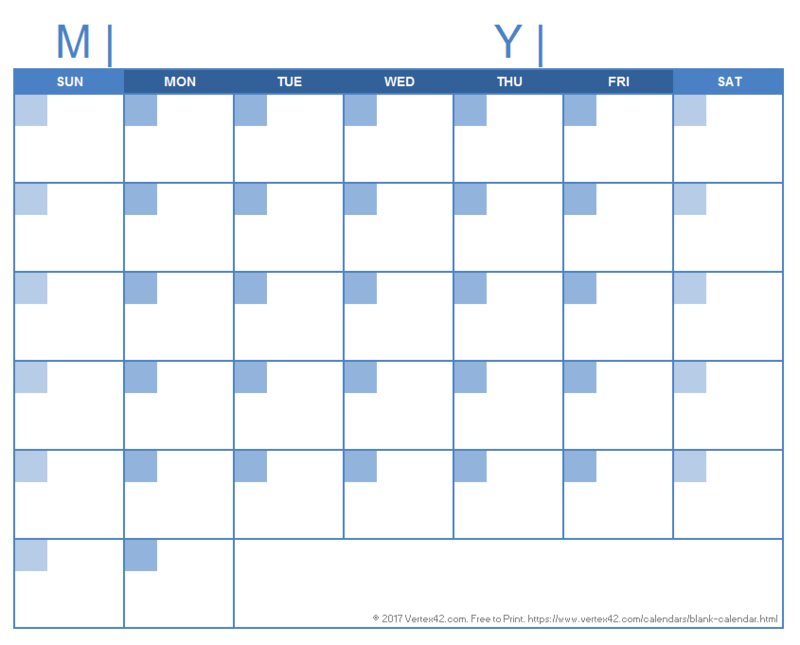 The grid for this calendar was created using a bunch of shape objects in Excel. Shading was added to the objects to make the elements of the calendar look like they are floating above the paper. The name for this design came from the fact that it somewhat resembles a blueprint (for a storage room or domitory or something like that). Perhaps "Boxy" might be another way to describe it. Not a very flashy title for this design, but THICK refers to the border style. You don't often see a triangle shape used in a calendar grid, but if you are looking for something a little different, this one is cool. 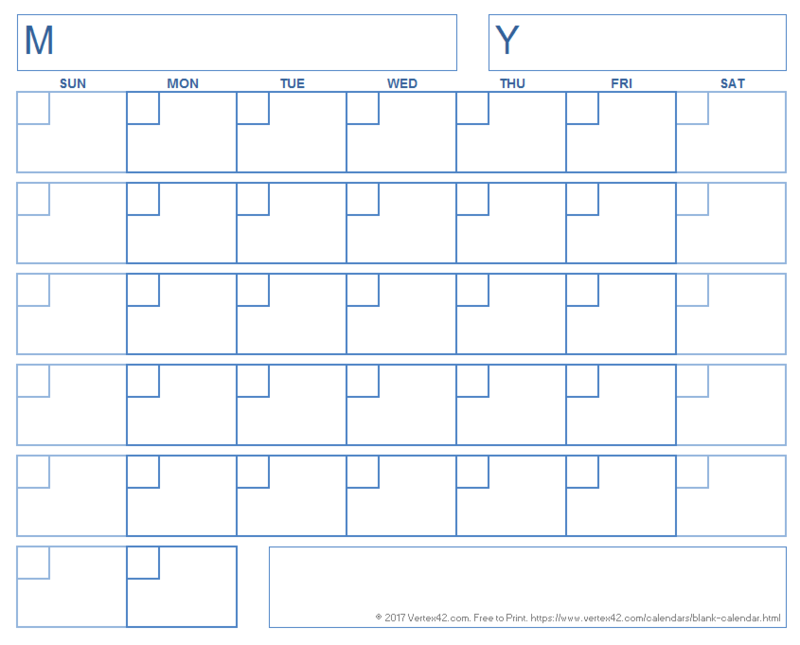 Blank Calendars in HTML, from www.abcteach.com - This page has a number of free blank printable html calendars - tailored to teaching. They have some creative ways of displaying the month names, and allow you to fill in the days of the month. 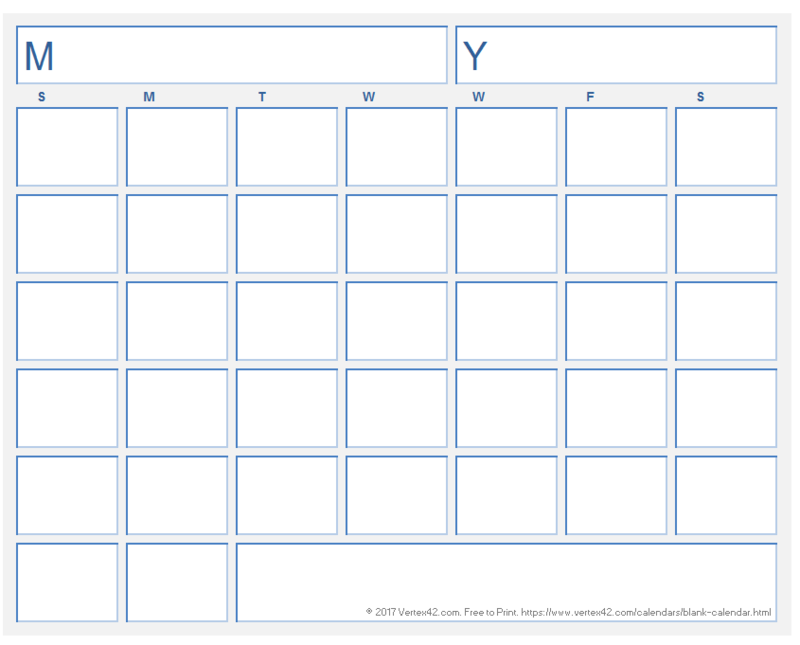 Free Blank Calendars, from donnayoung.org - Provides blank calendars in PDF format for homeschooling. If you want to find other blank calendars in PDF format, do a Google search with "filetype:pdf" included in the search phrase, such as "blank calendar filetype:pdf" or use the Advanced Search feature to limit your search to PDF files.